Controversy. Time and time again, it seems like tattoo is always followed by some sort of controversy. One would think that at this point in human existence, given the immense rise in popularity of tattoo and the common place nature it all, that tattoo would be about as controversial a topic as choosing one soft drink brand over another. No way, Jose. Controversy is rife in the ye ole world of permanent ink. When you think about it, it’s quite amazing that human beings adorned with ink could still cause any sort of uproar at all, given the lengthy history of tattoo. After all, it’s not like we’ve only just learned of this art form and it’s not like any of us are seeing it for the first time. Whether it’s through henna, images in magazines, temporary tattoos that accompany pieces of bubble gum or simply doodling on arms and legs with a marker we are all exposed to tattoo from a very early age and consistently throughout our lives. So does who gets what tattoo and where have anything to do with us? Or is it simply a matter of the media relentlessly telling us that something is shocking and/or offensive? That is, is controversy surrounding tattoo ever really a controversy at all? In my opinion? No. Not at all. 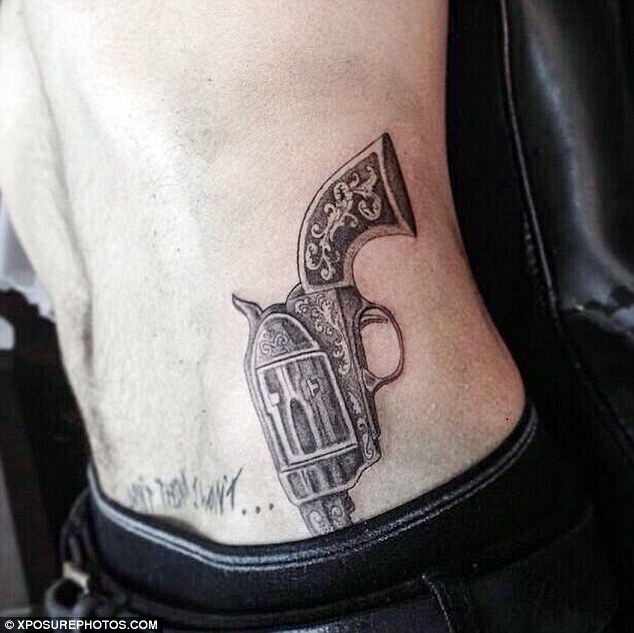 The most recent example of non-controversy in the world of tattoo is the latest tattoo inked onto Zayn Malik, a singer from the UK boy band One Direction. The 20 year-old teen idol recently had a six-shooter tattooed along his ribcage, to give the gun the holstered at the side look. It’s a tattoo that many, many people have, yet somehow given that it’s on a celebrity, many are labelling it a controversial act. Okay. First off? No. Absolutely, positively, 100% NO. Malik isn’t promoting guns. He doesn’t have an agenda. He got a tattoo of a gun on his body. That doesn’t mean that he shoots guns, own guns or wants others to buy weapons and brandish them about in shopping malls, high schools or movie theatres. Let’s get a bit of perspective here, alright? Calm it down. Second, if we’re really going to be worried about the impact weapons have on the delicate minds of children and teens, we should be especially concerned about their exposure to the news and to war and toward encouraging them to join the military. They should be safeguarded from violent video games, films and any forms of music that mention guns or weapons of any sort. Books are dangerous too. They shouldn’t be allowed to read any books that mention guns or that have characters who use or carry guns. It’s probably also a good idea to scrub out the word “gun” from any dictionaries that teens may have access to. Even this blog post should probably come with some sort of warning, so if you’re a teenager who happens to be reading this, stop right now. I don’t want you thinking about guns, ever. Ridiculous, right? Of course it is. The guy wants a tattoo of a gun, the guy gets a tattoo of gun. The entire incident carries as much weight as we give it. So let’s all agree to do this: let’s not give it any weight at all. Let’s just chalk it up to what it is – yet another celebrity getting yet another tattoo. It’s absolutely harmless. So Ray Nelson and all the media and anyone else who has a problem with this tattoo, I have one message for you: calm down. It’s a tattoo.